A Reefer in GTA III. The Reefer is a recurring boat introduced in Grand Theft Auto III. Based on a common shipping and fishing vessel, the Reefer is a slow yet durable fishing boat that can be obtained from a dock or on the water. 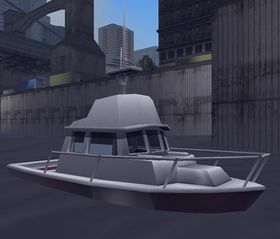 Over the course of the series, the boat would be outfitted with fishing poles in GTA Vice City and GTA Vice City Stories, or a fishing net winch and crates in GTA San Andreas; the Reefer in GTA Chinatown Wars is also evidenced during "So Near, Yet Sonar" to be able to support a heavy salvage crane, as well as a sonar radar. With the exception of post-GTA IV renditions, the Reefer tends to feature a large spinning marine radar antenna; masts are added on the GTA San Andreas, GTA IV and GTA Chinatown Wars versions, with GTA IV rendition featuring the radar or communication equipment mounted on its mast. The Reefer in GTA IV also features a long pulpit extending off the bow (at the front), similar to the one found on the Orca in the movie Jaws. Also, unlike the previous renditions of the Reefer, the player can climb upon the roof of the boat's cabin in GTA IV. Up until GTA San Andreas, Reefers were seemingly imbalanced, often pitching forward when in motion and resulting in their bow's decks constantly dipping underwater. GTA Chinatown Wars, salvage "So Near, Yet Sonar" variant. In addition to being slow, it can hold only one passenger despite its large size. It is also a very poor choice of vehicle in a police chase because it will be quickly destroyed by police boats and lacks the speed or maneuverability to evade them. The Reefer is similarly not recommended for online play in GTA IV due to its slow speed which makes it an easy target for enemy machine guns or rocket launchers. The Reefer wreck in GTA Vice City. Its name is a reference to the slang for marijuana plant. The Reefer exists as a shipwreck in GTA Vice City, underneath the bridge running from Prawn Island to Downtown Vice City. San Juan Sounds in GTA IV. A Reefer from GTA Vice City can be found in Rockstar North's Manhunt 2. If the player jumps within the inner part of the Reefer in GTA IV, they will appear on the roof, as if the player "jumped" at the Reefer. In The Ballad of Gay Tony mission "Clocking Off", a black variant of the Reefer is seen; however, it is unobtainable. Docked at the marina near Juan Cortez' yacht in Ocean Beach, Vice City. Docked at Easter Basin Naval Station. Docked next to the Ferry Building in Esplanade East, San Fierro. Docked at the pier in Rockshore West. Many can be found in the coastal areas of San Andreas, especially the ones surrounding Los Santos Inlet/Back o Beyond and Las Venturas. This page was last modified on 17 October 2012, at 11:24.